We have invested in the latest equipment to allow our pallet operatives to repair to the highest standard possible. We repair on purpose built, ergonomic benches with spring balances for the pneumatic nailers to reduce the stress on our operatives. We are continually looking to improve and automate our pallet handling processes to keep our costs to a minimum and share the benefits with our customers. New wooden pallets have been shown to have a negative carbon intensity due to the fact that whilst a tree is growing it absorbs carbon from the atmosphere. Once this pallet enters the reconditioned pallet sector it can continue to be repaired and re-used reducing its carbon footprint still further until the pallet reaches the end of its life. At this point the pallet can be easily disassembled or chipped to create a recycled product. 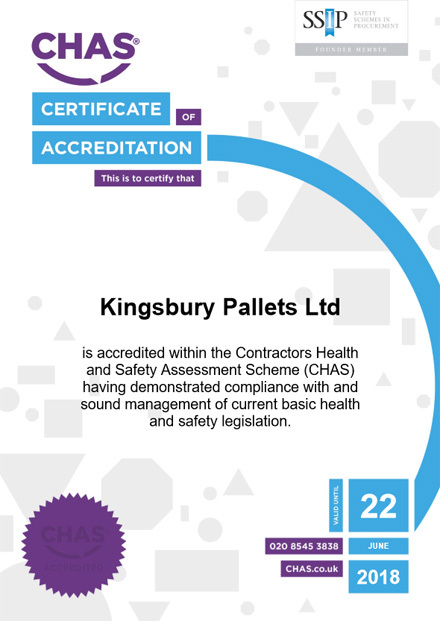 Whenever possible Kingsbury Pallets will recycle waste & make use of recycled products. Comply with environmental legislation, in particular regarding waste disposal. Minimise the Company’s impact on the environment, in particular through the reduction of pollutants, conservation of energy, fuel & water and the use of sustainable resources. Identify & consider environmental issues when undertaking business decisions. Increase Employee’s awareness of environmental issues and their impact in the workplace. Avoid inconvenience to our neighbours & considering the opinions & rights of others in managing our daily business. We recognise the importance of Health and Safety in the workplace and are committed to providing a safe environment for our employees and visitors. We have our own dedicated full time Health & Safety manager qualified to both IOSH and NEBOSH standards to promote good health and safety practice in the workplace. We are an Equal Opportunities Employer and our Statement is available upon request. Our Social Accountability & Ethical Statement is also available upon request.